The factories clustered northwest of Taichung established Taiwan’s fame as a “bicycle kingdom.” But component maker SRAM, a pioneer in cutting-edge shifting systems, has had to resort to building factories on adjacent agricultural land. SRAM’s automated factory in the Shengang District of Taichung is a state-of-the art bicycle component plant. Robot arms and automatic machine tools operate on an anti-static, anti-magnetic, dust-free production line. SRAM, which also owns factories in the United States, Germany, Portugal and China, is currently ramping up mass production of the world’s first wireless shifting system, ahead of its main rival, Japanese gear shift maker Shimano. An invisible demarcation line, however, cuts across the factory. The first 100 meters stretching from Zhongshan Road in the Shengang District is built on industrial land, while the remaining 500 meters of the production plant stands on agricultural land. The factory has effectively been built in violation of land use rules and regulations. One year after founding the SRAM world headquarters in Chicago in 1987, company head Stanley R. Day moved production lines to Taichung. In the 26 years since, the original factory of some 300 square meters with just twelve employees grew into a large operation with more than 2,000 people. The company is a world leader in bicycle gear shifts, shock absorbers, rims and chains. Although SRAM is a star in Taiwan’s industrial landscape, it still appears on the list of unregistered factories. Moving to these locations would have been very difficult for SRAM. The company started out as a small American company. It managed to grow into a global champion thanks to the bicycle industry cluster in central Taiwan. The key factor driving the company’s expansion was its close proximity to its major customers. SRAM’s biggest customer is Giant Manufacturing Co. Ltd., the world’s largest bicycle maker, which is located north of SRAM in the Dajia District of Taichung. Its second largest customer, Merida Industry Co. Ltd., is based in Yuanlin in the south of neighboring Changhua County. Kao points out that Shengang-based SRAM is conveniently located at the mid-point between Giant and Merida, which benefits all three companies. Second, over the past two decades or so, a bicycle industry cluster has evolved in central Taiwan around Giant and Merida, which earned the island the title of “bicycle kingdom”. Not surprisingly, suppliers of parts and components settled in locations close to both bicycle makers. Giant, Merida and SRAM all belong to the “A-Team”, a collaborative alliance of Taiwan Bike Association members involved in knowledge sharing and industrial upgrading. SRAM alone works with some 500 suppliers. A Team companies have opened up their factories to learn from each other, discuss quality issues and supply chain efficiency. As the bicycle cluster in central Taiwan grew stronger, SRAM, which originally manufactured in the United States and Germany where its products were designed, relocated R&D and manufacturing to Taiwan. Producing top quality, technically advanced products in Taiwan, SRAM was able to catch up to global industry leader Shimano. A SRAM rim, for instance, sells at a steep price tag of NT$50,000. “Others produce with a precision of 3µm, but SRAM demands 1µm. Because we have honed such precision and quality over time, made in Taiwan is as good as made in Germany,” Kao insists. But this also means that SRAM cannot give up the outstanding suppliers with whom it has worked for decades. Inside the SRAM warehouse is a large board with delivery schedules. At one glance it becomes clear which suppliers have delivered on time and which have failed to do so. The A-Team has established standardized requirements for “just-in-time” delivery from the big companies like Giant down to the small parts and components suppliers. The aim is to achieve punctual delivery along the supply chain for just-in-time manufacturing to avoid unnecessary inventory. Since reducing inventory helps save unnecessary costs, SRAM, Giant and Merida have implemented such systems throughout the supply chain, forming a closely interconnected community with their suppliers. 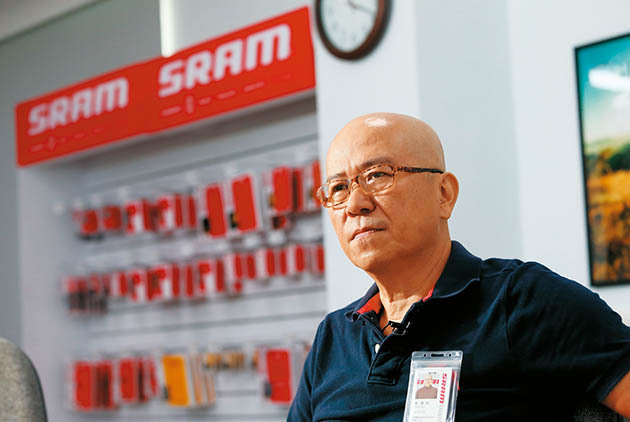 If SRAM were to relocate to Yunlin, it would move away from the bicycle industry cluster with no guarantee that its suppliers would be able to follow suit. Transit time, the time it takes for materials to reach the customer, would increase by more than an hour, if not more. Another headache for the company is the fact that the 1,750 employees working at the Shengang factory are local people who would find it difficult to move with the company should it relocate too far away from their current homes for a daily commute. Losing employees that have been trained over a period of more than 20 years, says SRAM, would create great difficulties for the company. If the industrial zones offered by the Ministry of Economic Affairs are too far away, why doesn’t SRAM look for a site closer to them? The SRAM factory is located in the cluster formed by the three districts of Shengang, Tanzi and Daya, where illegally built factories abound, and industrial land is extremely scarce. Lin Ching-yen (林清炎), general manager of Asiatic Insulated Aluminum Window Co. Ltd. in Tanzi, has been trying to get his factory legalized. “In the 40 years that have passed since I came to Tanzi, I have not seen Tanzi plan any industrial zone, not a single piece of industrial land that allows us to settle down,” Lin complains. When the Taichung City Government eventually said it would build the Tanzi Juxing Industrial Park to help unregistered factories legalize their operations, Lin immediately went to register for a land purchase. “I have waited for six years now, but planning has not yet been finalized. When it has finally been built my hair will have become white,” says Lin, venting his frustration over the project’s slow progress. In comparison, SRAM was lucky because it held out until the Taichung City Government finished planning phase one and phase two of the Feng Zhou High Tech Industrial Park. Another company had leased a plot of land inside the park but kept putting off construction. When the city government threatened to take back the land, the company hastily released the plot to SRAM. “When I went to rent land, I could get at most two to three thousand pings (1 ping is about 3.3 square meters). The entire industrial park has only about 100,000 pings, and we wanted 60,000 pings. It is impossible for them to give us more than half of it; the others would protest,” says Kao. While the Feng Zhou High Tech Industrial Park offered an opportunity for the legal registration of a factory, the available space again proved inadequate for the company’s expanding land needs. Proximity to customers and markets as well as pressure to eliminate capacity bottlenecks to fill orders were major considerations. Caught in this dilemma, SRAM eventually felt compelled to expand its manufacturing facilities from the existing industrial site onto adjacent agricultural land. Nearly 20,000 factories in the Taichung area are unregistered. Among these, only about 5% have applied for legalization, while the vast majority of companies with unregistered factories continue to turn a blind eye to the situation. Had SRAM not decided to ask the government for advice on how to legalize its factory, its violation of land use regulations would most likely have gone unnoticed. Kao is adamant that the circumstances force businesses to circumvent the rules. “We proceeded in this way because we were backed into a corner; we only did this because we had no alternative. This is not simply our problem; such problems are abundant across Taiwan. But now we definitely don’t want to do it anymore,” Kao says. SRAM hopes that the government will be able to find about a hundred hectares of land north of Taichung; then the entire bicycle industry cluster could move its manufacturing plants there. This, they say, would solve the problem of unregistered factories and empower the bicycle industry to create a new miracle that would give Taiwan’s sluggish economy a shot in the arm in a true win-win situation.